Born and raised in Las Vegas, NV, Tarin graduated from UNLV with a bachelors degree in Business Marketing. She received both academic and athletic scholarships to play volleyball, receiving numerous accolades throughout her career. 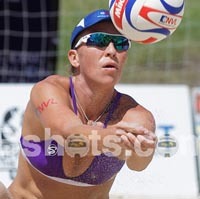 Tarin made the move to southern California in 2005 to follow her dream of becoming a professional beach volleyball player. She currently lives in Hermosa Beach, CA and works for a Web Design and SEO company in New York. In her spare time, Tarin likes to snowboard, travel, fish and play a variety of sports. Her parents are her inspiration and her biggest fans.